This is an Anime Club for people who love anime, where people who love anime can be friends with those who love it too. This is also an Anime RPC Club as well, it's for those who love anime so much they make their own anime character. I hope you join and alot of others do too! 4. Nami and Kira Rock Your Socks! 3. Nami and Kira Rock Your Socks! There will be updates frequently and also I will try my best to make the club as great as possible. I also have role playing characters they are on my idols! There is only 1 account that is not about role playing which is Mystery Dungeon! Team Neon! 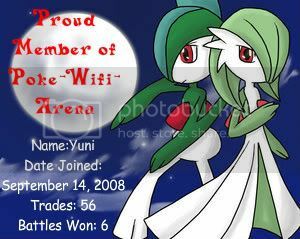 That is my normal account that has SOME info on me..
Login or register to add Yuni as your friend!